The Playford Ball is our big event of the year, and we select from the best callers and bands available. It is a costume event, with most dancers dressing up in impressive period costumes. The venue is The Cavendish Hall at Edensor, which is part of the Chatsworth Estate, and just half a mile from Chatsworth House. A cold buffet of meats and salads, plus desserts, is provided during the interval. 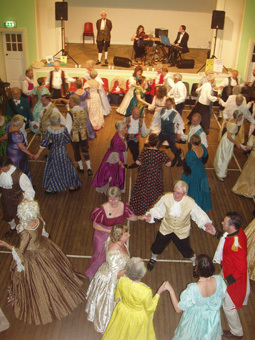 The picture shows our 2006 Ball at Edensor, with Alan Davies calling and Folkus Pocus providing the music. We limit numbers to 72. Members can book on Wednesday Club evenings, usually from the 4th Wednesday in May. For non-members, bookings open on 1st July, and should be made by post, details below. The hamlet of Edensor is part of the Chatsworth Estate, located on the B6012 between Rowsley and Baslow, not far from the Matlock - Bakewell section of the A6, and about 17 miles from the M1 J29/J30. There is plenty of parking at the hall. The postcode is DE45 1PJ. Printable A4 This gives an outline map and instructions, suitable for printing. Capacity is limited to 72, but there are usually adequate places available for non-members. Bookings should be made by post. Send a cheque for the full amount (see above) and enclose a stamped addressed envelope. Bookings will be processed on 1st July, and tickets sent out shortly after this date. You can send a booking before then, in which case please date your cheque for 1st July. Please state if you are vegetarian. For telephone enquiries contact Christine, tel 01629 732210.